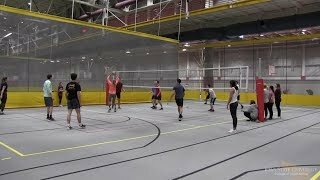 Students of the Department of Electrical and Computer Engineering (ECpE) at Iowa State University have been achieving dreams outside of their majors since the start of the department in 1909 and even before. Two students in ECpE became mayors of Ames, Iowa, decades ago, both with degrees in electrical engineering (EE) from ISU. Frank Hinman Schleiter, an 1895 graduate, and Frank D. Paine, a 1909 graduate, both grew up over a decade apart — but they persisted on similar paths after graduating from ISU. While the two Franks played monumental roles in the well-being of the city as mayors, they each left their own marks on Iowa State as well. 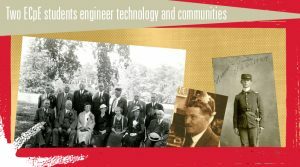 According to the ISU Library Archives, Paine played a large role at ISU after graduation, returning as an EE instructor after working in the EE industry for several companies and years. Before graduating, he was also on the “The Bomb,” the ISU yearbook board, and the Junior Trot Committee, as well as becoming class treasurer and vice president. Paine was elected to two honorary engineering fraternities — Eta Kappa Nu and Tau Beta Pi, which are still around today. He was also a member of Delta Upsilon, a well known Greek fraternity. 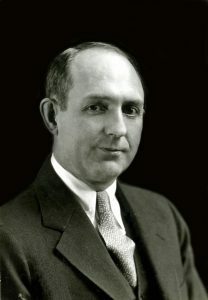 Later on, Paine became the head of the general engineering department at ISU from 1929-1942. The general engineering department later morphed into the College of Engineering. 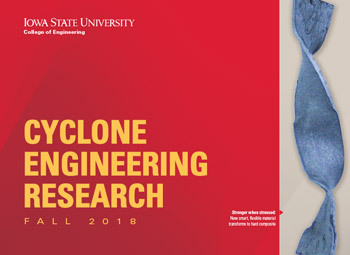 Aside from engineering-related contributions to ISU, Paine is also remembered for creating the popular acronym VEISHEA (Veterinary Medicine, Engineering,Industrial Science, Home Economics, Agriculture). VEISHEA became the first and largest student-run festival in the nation. Festivals across the college were combined into one celebrating all the college’s divisions at once. VEISHEA ran from the moment Paine created the acronym until 2014, lasting 92 years. Paine and Schleiter played a large role at ISU, with different and important contributions. Outside of engineering, Schleiter was involved in both the ISU orchestra and the Bachelor Debating Society. 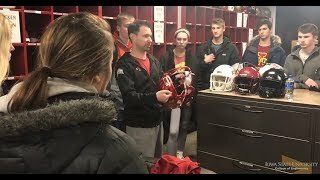 He played the flute in orchestra, but the baritone in Iowa State’s band. Schleiter graduated from ISU 14 years before Paine. According to “The Milepost,” Schleiter “became one of the progressive, public-spirited men of the community.” And at 50 years old, he became the 27th mayor of Ames, Iowa, after practicing a profession as a banker prior to his election. The people of Ames remembered him as “quiet, cordial and friendly,” yet he preferred to run on the sidelines, outside of the limelight. Class of 1895 reunion photo. 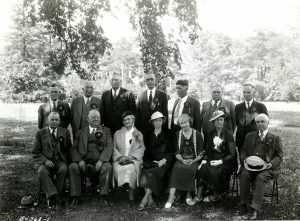 Frank Schleiter: Third from the left in the back row. engineering. Paine was also influential; during his tenure as mayor from 1930-1942, additions were added to both the Mary Greeley Medical Center and the Ames Public Library. Paine passed in 1942, while still mayor of Ames. 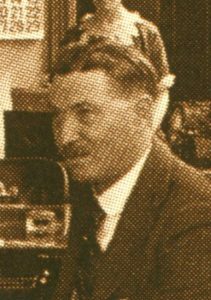 Schleiter passed in 1943, just one year after Paine. The two ECpE alums made strong and significant impacts on both Iowa State and Ames throughout their time in the city. Both are recognized online on the Ames Historical Society website and will forever be remembered for their vast contributions through the city and university.